I will start off by saying this is the first time I’ve cooked sweet potato. Which is probably surprising, because everyone loves it and it’s good for you and as a future dietitian I should certainly be eating some sweet potato. However, I’ve always hated things that are sweet but should be salty, i.e. sweet potato fries, kettle corn. Therefore I tried hating sweet potato for awhile, but recently became more open to sweet potato fries (with salt and ketchup, of course). Since fries are not remotely healthy, and regular potatoes are not paleo, I decided I needed to try sweet potatoes in another dish. I found this recipe on Pinterest and tweaked it a bit; the result was DELICIOUS. I am now on the sweet potato train. It was awesome with the sausage, peppers, and onions, since it added some sweetness. 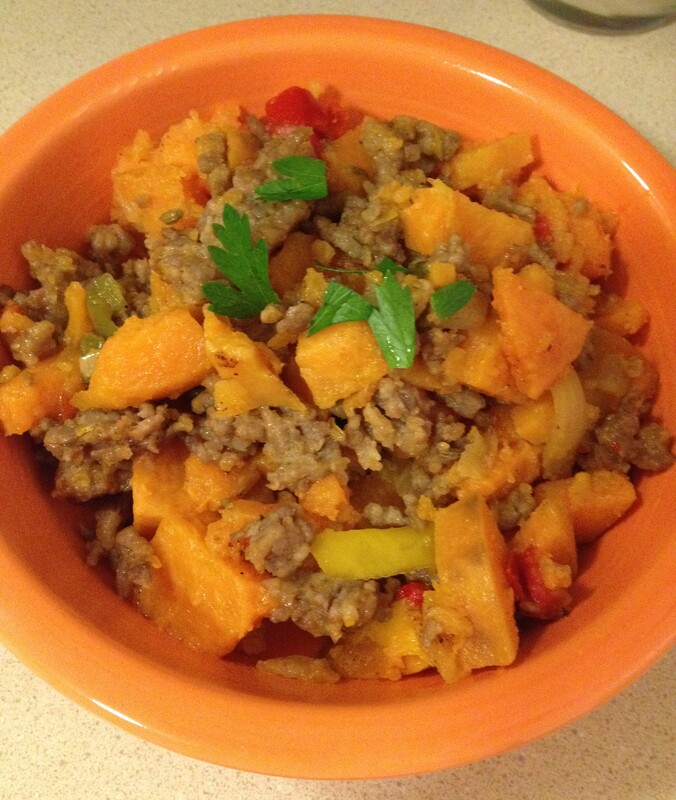 I used mild Italian sausage, but my boyfriend said the sweet potato would have paired better with spicy sausage…I’m also not super adventurous with spice, but I made a bold move with the sweet potato and it worked, so who knows! Maybe I’ll start eating everything with ghost peppers someday (probably not). Anyways, enjoy this easy and yummy recipe! 1.) Brown the sausage on a skillet with a little olive oil; set aside in a bowl. 2.) Meanwhile, peel and dice the sweet potatoes. 3.) Using same skillet, heat olive oil on medium heat and cook peppers and onions until slightly soft. Then add sweet potato, stir everything together, and cover skillet with foil. Lower heat to medium low (about 4) and cook for about 15-20 minutes, stirring occasionally, until sweet potatoes are soft. 4.) Mix sausage in, add salt and pepper (to taste) and crushed red pepper (optional). Let cook for about 2 minutes. Serve and enjoy! (I garnished with parsley from our garden, but you don’t need that). Glad you liked the recipe. My husband would probably like the addition of the peppers. It’s also great with an egg on top! I am obsessed with sweet potato. Wayyyy better than regular potato.